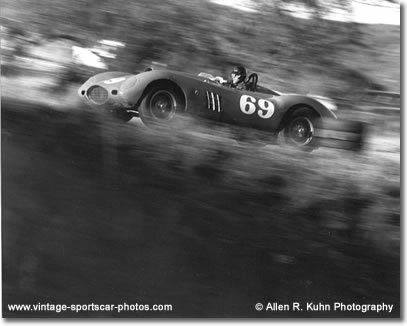 Allen R. Kuhn's career as a photographer of sports cars began when he attended the 1956 Torrey Pines road races as a 17 year-old high school student. Having won an award, in the Eastman Kodak National High School photo contest, with a photograph of Fred Woodward in a Jaguar Special, he became increasingly interested in sports car photography. This interest lead to his enrolling at a photographic school in Los Angeles where he spent two years refining his camera techniques and developing (no Pun) his skills in the darkroom. Over the next ten years he became the staff photographer for the Sports Car Journal and California Sports Car Magazine, shooting at many Southern California road courses. However, as technology increased and car design changed from the rolling artistic sculptures of the late 50's and early 60's, Kuhn's interests also changed. The L.A. Times Grand Prix for Sports Cars in October 1965 was the last race he covered. 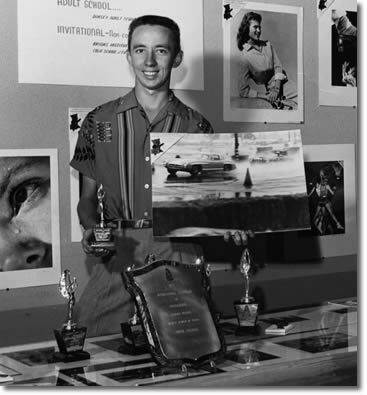 Photo: Allen Kuhn at the 1957 at L.A. County Fair photograph contest. Age 19. The winning photograph is from Pomona 1957 of a Mercedes Benz 300SL and Lancia. His negatives now were put to rest, for the next 30 plus years, until a chance meeting with the editor of the Vintage Racecar Journal (Casey Annis) at the Tustin Thunder vintage races in Southern California in 1998. Kuhn then began to bring the long-neglected negatives back to life. Tom Trabue, winner of the Monterey Cup and the Ken Miles Trophy at the Monterey Historic, was one of the first people to ask Kuhn for pictures. Tom asked if he had any pictures of a Denzel. What the heck is a Denzel? After searching through almost all of his 5,000 negatives, he finally came across what looked like a Porsche Speedster, but not quite. Thus began the searching and printing ritual that has become his quest—to bring back to life an era now much loved by an ever increasing number of enthusiasts. He now has a worldwide list of aficionados who have purchased his photographs. His work has graced the pages of some of the better known magazines: Forza, Excellence, Cavallino, Vintage Racecar Journal and soon to be in Vintage Motorsport. He also shows his photographs at numerous vintage races and concours. One of his last shows was the Ferrari International Meet in Los Angeles, California. He plans to attend the Mercedes Benz Meet at Newport, Rhode Island, in 2004, thanks to the kind invitation of Bob Sirna, editor of the Mercedes Benz National Newsletter. Photo: This photo of Dan Gurney at Paramount Ranch won first place in the photojournalism category at both the 1958 L.A. County Fair and the L.A. Trade Technical Junior College photography shows.